PACO DE LUCIA, THE SON OF "LA PORTUGUESA"
This work is a chronicle of the life of the genius Paco de Lucía, from his birth in Algeciras to his unexpected death in Mexico. It omits no detail about his sometimes complex relationships with contemporary guitarists such as Manolo Sanlúcar and younger players. It also covers his forays into jazz, classical music and pop music. The result is a moving, sincere book in which the most intimate side of the man comes out in his political opinions, his search for adventure and anonymity, his passions, his dreamlike childhood where he took refuge and his eternal devotion to copla. 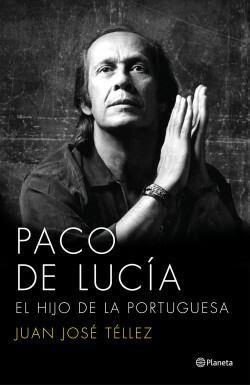 The life of Paco de Lucía and the people around him, published a year after his death by a close friend of the artist.